A common complaint about Etsy is that it is so full of great stuff but it is hard to find it. I've heard that consistently since we first got involved in 2006. That hasn't hurt its growth, which has been amazing, but it has made the buying experience difficult. Enter Etsy Pages, where bloggers and design/fashion brands curate Etsy for you. If you like Apartment Therapy, here's what they think is great on Etsy right now. If you like Food52, here's what they think is great on Etsy right now. And if you are a fan of West Elm, here's what they think is great on Etsy right now. Check them out and I think you will like them. As my colleague Brittany said about Etsy Pages, "it's like a Pinterest board where you can buy stuff". I had dinner with my daughter Jessica last night. We got to talking about creativity. She's a photographer. I asked her how she thinks Pieter Hugo comes up with his ideas for photos. She said "I bet he reads a lot about the topics he is interested in and then writes his own thoughts down and from that comes the ideas for the work". That led to a long discussion about the value of reading and writing, with a particular emphasis on writing. I told her that I toiled in the VC business for close to twenty years before I hit my stride and the reason I found my stride was my adoption of blogging. As all of you know, I write every day. It is my discpline, my practice, my thing. It forces me to think, articulate, and question. And I get feedback from it. When I hit publish, I get a rush. Every time. Just like the first time. It is incredibly powerful. And it is permanent. There is a long and winding record of my thinking out there on the public Internet. Google "mobile app deep linking" and you find my post first. At the top. That's because I have been thinking about mobile app deep linking and I wrote my thoughts down. What struck me about Twitter? That's here. I wrote it down. Runway is the amount of time you have until you run out of cash. Or until you raise another round. Or until you can get the business self sustaining/profitable. Runway is survival. And so everyone in the startup world is obsessed about runway. And yet, if you wanted to make your runway as long as possible you would raise as much cash as you could and/or you would keep your expenses as low as possible. I have seen teams do both and you know what? Neither works too well. The fact is that the amount of money startups raise in their seed and Series A rounds is inversely correlated with success. Yes, I mean that. Less money raised leads to more success. That is the data I stare at all the time. It makes little sense at face value but it is true based on more than two decades of experience in the startup world. Keeping your team lean does work and I advocate for that all the time. Tumblr went for close to two years on a two person team. But those are two special people. Most startup teams can't do that. Most startups need to hire at least a half dozen people or more to get a product out the door and then iterate on it, scale it, and make it work. And that costs money. To my mind, maximizing runway is not the game startups should be playing. Getting somewhere fast is the game they should be playing. You can always raise more money if you are doing well on the metrics that matter in your business. So focus on that and runway will take care of itself. If you can get the plane to take off, the length of the runway matters less. If you can't, there is no runway long enough for you. We see gamification all over the place on the web and mobile. We are collecting followers in Twitter, likes in Instagram, levels in Candy Crush (I don't play Candy Crush but I know people who d0), and mayorships in Foursquare. People like playing games. When I read that line, it struck me as basic truth. Gamification can amplify things people already like to do. But it cannot get someone to do something they aren't inclined to do in the first place. So as we design gamification into our apps, games, and lives, it's worth understanding what it can and can't do and what it is good for and what it is not good for. And a big happy birthday to Stack. Five years, five million programming questions answered. And those answers are viewed by 45 million people a month. I didn't realize there were that many programmers in the world. Maybe services like Stack are making it easier to be a programmer and the number of programmers is growing as a result. Hmmmm. I am a big fan of exit interviews. I have learned more doing exit interviews than most other management techniques. When people are on their way out and have no fear of saying exactly what they think, you can learn a lot. It is rare for an investor/VC to do exit interviews. I only do them in situations where there seems to be a significant problem in a portfolio company and I want to get to the bottom of it. But if you are the CEO of a company, you should be doing exit interviews with everyone who leaves your company until your company gets to the point that it is impossible to do that. Once you pass that point, your senior team should be doing them along with you. Here's what I like to do. First, get a sense from the exiting employee's manager what the cause of departure was. Get the manager's take on the situation. Context is very helpful in situations like this. Second, don't make an exit interview a witch hunt. Make it a conversation about the good and bad things about the company, the job, the people, etc. The less confrontational the exit intereview is, the more you can learn. Finally, don't take everything that is said as gospel. There are always two sides to every situation. I like to understand both sides as well as I can. Everyone has an opinion and an agenda and its best to understand everything in that context. Doing exit interviews is a lot like doing references. The patterns that emerge over multiple interviews are the most telling and that is what you want to be listening for. Exit interviews are a great way to get those patterns out on the table where you can see them. We invest in a lot of marketplaces. When they scale, we often hear complaints from early adopters, amplified by the media, that the early adopters are getting hurt by the "mainstreaming" of the marketplace. You hear that kind of argument with other kinds of networks as well. When Twitter went mainstream, a lot of the early adopters complained that it had lost its soul. Almost five million people have backed a project on Kickstarter, and more than a million have backed two or more projects. These repeat backers are responsible for 59% of the total money pledged to Kickstarter projects — a whopping $444 million. On average, 2,130 people a dayhave become new repeat backers this year. This is huge! Future creators will benefit from more and more people using Kickstarter. We have seen a similar effect at Etsy. When a wave of new sellers came to Etsy as it became a mainstream marketplace a few years ago, the early sellers were concerned about the competition these new sellers would create for them. But Etsy has grown its gross transactions at between 70-100% per year for the past five years, a rate that is roughly the same as the rate of new sellers joining the service. For every new seller that joins Etsy, it seems that there is a new buyer waiting to consider buying from them. The cool thing about these marketplaces is that the sellers (or project creators in Kickstarter's case) are the primary marketing engine. Sellers bring the first time buyers. And then many of them stick around and transact again and again, often with sellers other than the one that brought them in the first place. It is a commons where everyone (or most everyone) benefits from the expansion of the marketplace. The gentrification of Kickstarter doesn’t seem to be hurting its original inhabitants. It may even be helping them. The only quibble I have with that line is the use of the word "may". I am certain it is helping them. Video Of The Week: How Large Are The Planets And The Stars? A friend sent this video to me this week. I enjoyed it and I suspect you all will too. Best of all, it is only 2 1/2 minutes so it won’t take up much of your day to watch it. I like to do two kinds of posts on Friday, Fun Friday and Feature Friday. I thought we would try something today which is to combine them. So we are going to take turns in the comments talking about an app we like and our favorite feature in that app. Since that’s what I do regularly in Feature Friday, I am going to refrain from doing it here and all the action will be in the comments today. Are Universities The New VCs? If the university is a farm, do the students become the cows? I have promoted this idea of becoming an early stage investor to a number of Universities and schools within Universities for some time now. It isn't the IP and patents that are held by Universities that interest me. It is the human capital that is inside of them. Universities are organized to educate students and do cutting edge research. The byproduct of that is a lot of great ideas. In an era when the cost of a University education has gone up way faster than the value of it, we need new business models to sustain universities other than tuition increases, federally funded research, and the generosity of the alumni. I think capital gains from equity investments in startups that are birthed inside universities is an interesting idea and I am glad to see Stanford and some other schools trying it out. If Universities are the farms, I think students might be the farmers, not the cows. NYC Mayoral Race – As expected Bill de Blasio and Joe Lhota won their races. There is some question this morning whether de Blasio will need to do a runoff election with Bill Thompson or not. Either way, neither of them are what NYC needs which is to move agressively forward, not to head backwards. As Joe Lhota said in his victory speech, all you need to do is travel around to parts of the Bronx, Queens, and Brooklyn that fifteen years ago one could not walk into without taking their lives into their hands and marvel at the renaissance in these neighborhoods. We need more of that in NYC not a return to what NYC was like in the 90s. I plan to do what I can to elect a mayor who will take us in that direction. It is likely to be a waste of time and money but one must try to do what they believe is right. The iPhone 5C – Apple introduced two new iPhones yesterday, the new top of the line 5S and a less expensive phone called the 5C. This photo shows off the new iPhone product line. Here's my problem with that photo – the prices shown are all subsidized prices. 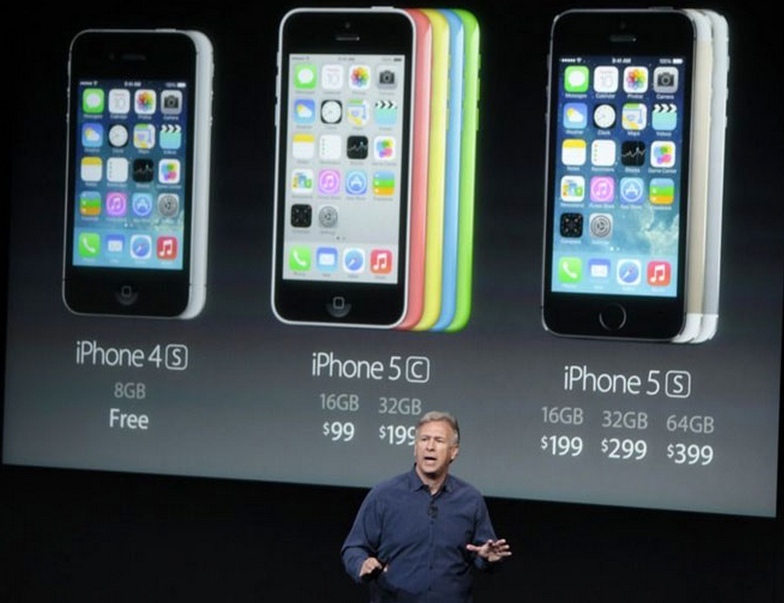 The iPhone 4s is not free, it is free with a two year contract. Who would sign a contract for two years to get a phone that is two years old? The reality of much of the world is that people don't sign two year contracts like we do here in the US. They buy pre-paid sim cards and stick them into unsubsized phones. And on that basis, the 5C is a big disappointment. It will sell for $100 less than the 5S in the unsubsized market, which means $549 for 16gb and $649 for 32gb. The C in 5C does not mean "cheap" as I had hoped. It means clueless, as in clueless about how the vast majority of new smartphone users are paying for their phones. So it's a morning of disappointment here at AVC. I stayed up late watching the returns and got up early thinking about this stuff. I am tired, cranky, and annoyed. I will get over all of it.